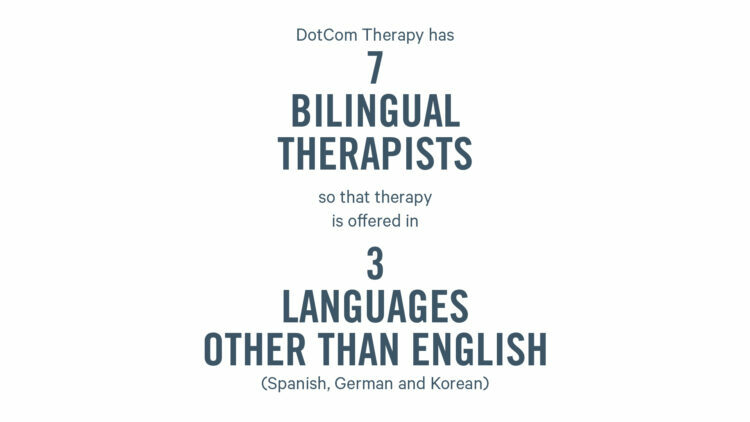 Two alumnae founded DotCom Therapy, an online delivery system for speech-language therapy and other services. 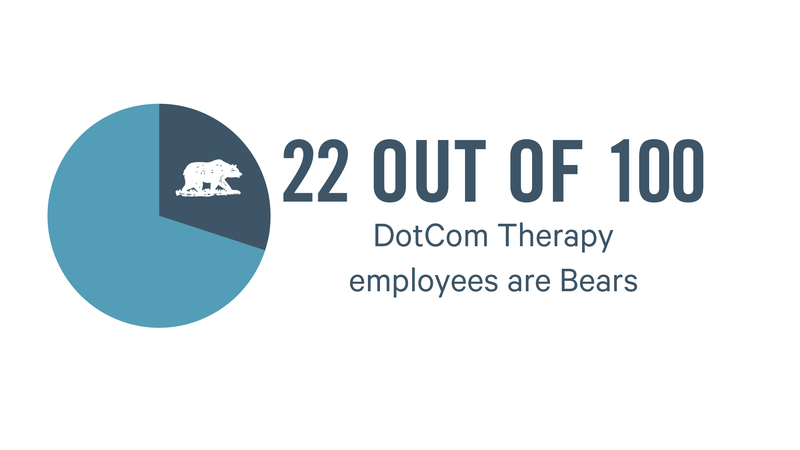 Many other Bears now work for the company, which is addressing a nationwide shortage of therapists. 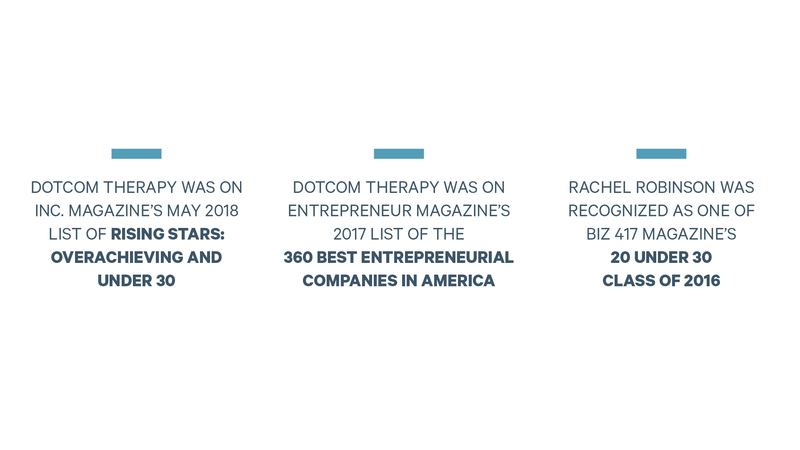 After just three years in existence, DotCom has been recognized in national publications and may expand around the world. If you subscribe to Inc. magazine, the national publication about entrepreneurship, go get the May 2018 issue. Got it? Great. Turn to page 30. 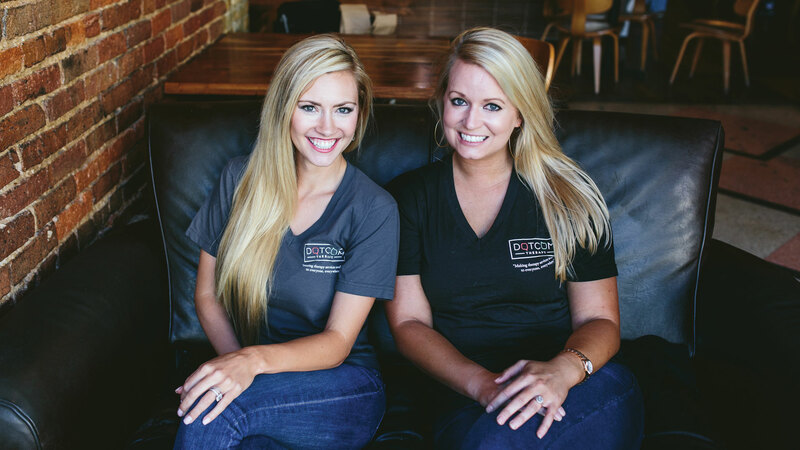 You’ll see the names of alumnae Emily Purdom and Rachel Robinson, and the business they founded, DotCom Therapy. They are part of the magazine’s cover story titled Rising Stars: Overachieving and Under 30. 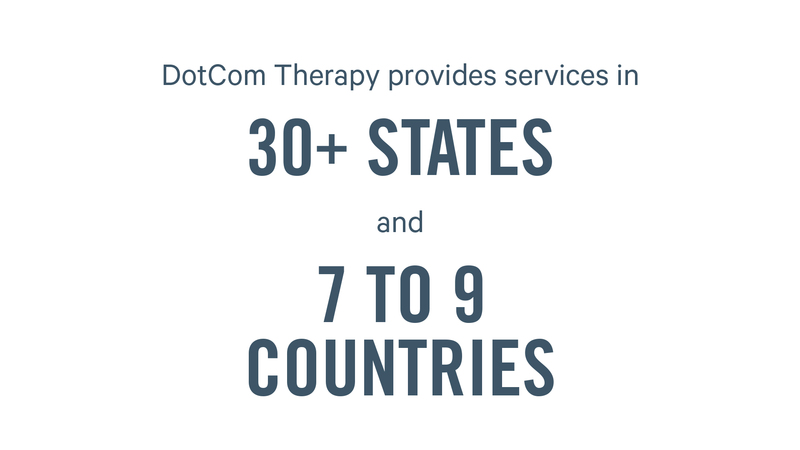 DotCom Therapy is one of just 30 businesses chosen by Inc.’s panel of star judges for inclusion on the list. It’s one of the latest accolades for DotCom Therapy, which has only existed for three years but is establishing itself as a new way to deliver speech therapy, occupational therapy, audiology and mental health services around the world. Purdom and Robinson started their careers as speech-language pathologists. These professionals provide speech and language therapy, which can help children or adults who have trouble speaking, understanding and using language. Speech-language pathologists may help children overcome stuttering or lisps. They can teach people to correctly produce sounds. They can help patients who have dementia, or have had strokes or traumatic brain injuries. They can help adults and children overcome difficulties with feeding and swallowing, also known as dysphagia. They may work with children or adults with conditions such as dyslexia or developmental disorders, such as autism. “I’m a twin sister, and both of us went to speech therapy as a child, which is partly what led me into this field,” Robinson said. Emily Purdom did a lot of driving for her first job. A lot. Three, four hours a day. She was working in schools near Branson, the area where she grew up. She drove so she could see all of her students. However, she knew the more sessions a child has, the better he or she can communicate with others. “Students deserve more than one visit a month,” she decided. Rachel Robinson started as a gerontology major at Miami University in Ohio. Then she took an introductory speech therapy course. She has worked in skilled nursing facilities and hospital systems. In one hospital job in Springfield, she worked with patients ranging in age from 6 months old to senior citizens. Just like Emily, she thought people needed more access. The two friends reunited in 2015 in Florida at the wedding of Abby Carroll, another alumna of the communication sciences and disorders program. This is where serendipity enters the story, Robinson said. Purdom had just started working with a new client — in Thailand. “The family reached out to me through a friend, desperate for services for their little girl,” Purdom said. The child was going into preschool and had a severe speech disorder. It was hard for others to understand her. She figured it out her own way, logging on to Skype at 5 a.m. to conduct sessions. The experience turned on a lightbulb for the two friends. In 2015, they founded their own company. They did a bit of contract work on the side, but mostly, they went all in. They called school after school, week after week. Few were interested. Teletherapy was such an unknown. But finally, they had some interest. A large rural school district in Alaska gave them a contract. But it came with stipulations. Purdom had to call Robinson to get her on board with the plan. Robinson didn’t let fear hold her back: “Yeah, of course. Let’s do this.” Two weeks later, they were on a plane to Anchorage. The on-the-ground team proved themselves, and became an online team. The Alaska district is still a customer. Nicole Pounds, a speech-language pathologist and MSU alumna, performs a session at DotCom Therapy’s office in Springfield. Three years later, DotCom Therapy has expanded at a rapid rate. As well as speech and language therapy, the company now offers occupational therapy, audiology and mental health services. The base of the company’s operations is Springfield, but their therapists can deliver services to anyone, anywhere. Here’s how teletherapy works: The person receiving the therapy, or a facilitator working with a student or adult at a school or clinic, goes to DotCom Therapy’s website. He or she clicks on the appointment, then selects “start session.” The session can take place on a computer, tablet or smart board. The therapist is on the other end at a computer of his or her own. Most work from home. The therapist then conducts a session with the client, just as if they were in a room together. He or she may use materials shared through DotCom Therapy’s platform. Those may be games, puzzles or worksheets for children, or newspapers and books for adults. Therapists tell the on-site facilitators not just what they need for the session, but why they are doing each activity. “We’re able to train facilitators in the techniques we’re using, and they’re able to carry it over throughout the week, in the lunch room, over recess and in the classroom,” Robinson said. Access to highly skilled clinicians. “We’re not hiring by zip code,” Robinson said. “Our hiring pool is all across the country. We’re able to bring the strongest clinicians to the table.” They have had more than 1,000 applicants, but have only hired about 100 employees. Customized treatments. Each patient is matched with a best-fit therapist, whether that’s an autism specialist, a bilingual clinician, etc. Convenience. Therapists can work outside traditional business hours. The company is growing so fast, Purdom and Robinson have completely moved away from conducting therapy. Instead, they do everything required to run a successful startup. DotCom Therapy’s office in Springfield is in a historic building downtown, with open floor plans, a stocked mini fridge, couches and candles. Most of the company’s directors work here, though Purdom and Robinson have moved to other cities. “They run the show out of Springfield,” Purdom said. 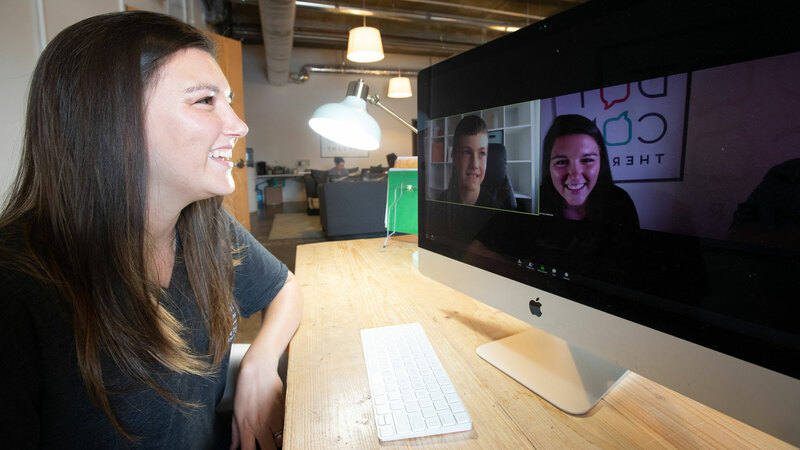 Elise Mitchell, a 2011 and ’13 MSU alumna with degrees in communication sciences and disorders, was the first official employee of DotCom. She was hired about six months after the company was founded. She’s now the executive director. “I quickly became passionate about their business model,” Mitchell said. They want therapists to have a work-life balance, Purdom and Robinson said. They encourage interaction and collaboration, offering virtual lunch breaks, town hall meetings and yoga for therapists. Mitchell said no matter how much DotCom Therapy grows, they’ve enjoyed keeping operations in Springfield. Growing globally. Their therapists already conduct sessions with people in places such as Canada, China, Japan, Mexico and Tanzania. In April, the company founders traveled to Amman, Jordan, as part of a project that is still in talks. “We are in a big push to develop our technology to allow people all over the world access to therapy services,” Purdom said. Working with MSU to demonstrate the efficacy of teleaudiology. Expanding their services into medical facilities with patients of all ages. Their main focus up to now has been building clients from school systems. Advancing the training they offer to teletherapists. Their goal is to be recognized for offering the best-practice standards in the industry. Emily Purdom had some hard circumstances during graduate school. She wasn’t excelling academically. Then, her stepbrother passed away. One of her main supporters was Dr. Julie J. Masterson, who was then a professor of communication sciences and disorders. Masterson is now associate provost and dean of the Graduate College. “Emily was a bright light just waiting to be encouraged,” Masterson said. Purdom, Rachel Robinson and Abby Carroll eventually became Masterson’s research advisees. “They were outstanding,” Masterson said. Purdom and Robinson went from students who sat in the back of class to confident researchers. Robinson learned some of her best problem-solving methods from Masterson. “She was spearheading research, and was just a strong and powerful figure,” Robinson said. 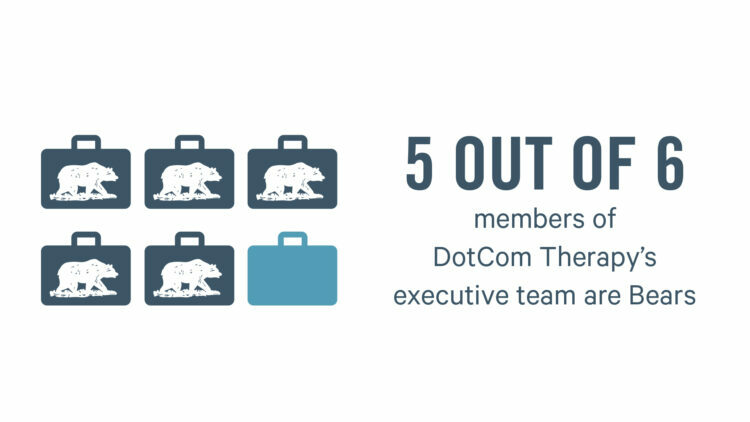 The founders of DotCom Therapy found more than mentors at MSU. The public affairs mission shaped their vision for global outreach and a positive work environment. That spirit of bettering the community translates into better clinicians, Purdom said. DotCom Therapy’s rising status in the business world shines a light on the quality of alumni from Missouri State’s Graduate College, Masterson said. The programs also translate to the real world. Masterson keeps in touch with Purdom and Robinson, chatting or emailing about every other week.